Egg donation is using the eggs of a preselected young female donor then fertilizing them by the sperm of the woman’s husband then transferring the embryos to the woman’s uterus. Egg donation is an effective treatment for infertility caused by decreased ovarian function. This is a problem that can occur at any age but is much more common in women above 39 years old. Fortunately, for women unable to conceive using their own eggs, donor eggs offers the highest pregnancy and delivery rates of any fertility treatment and still allows a woman to carry a child. The donors are young females, who passed medical history selection and blood tests for different transmitted diseases such as Thalassemia, Hepatitis B, HIV, blood group and others. They are anonymous. You can know the characteristics of the donors, age, skin color, weight, height, eyes, hair, but cannot see them. It's better to use fresh preselected eggs (oocytes) from already screened and selected young donors, than using frozen eggs (frozen oocytes). 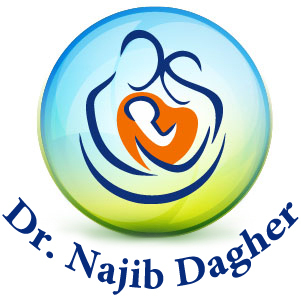 For more information, contact Dr. Najib Dagher in Lebanon - Hazmieh.